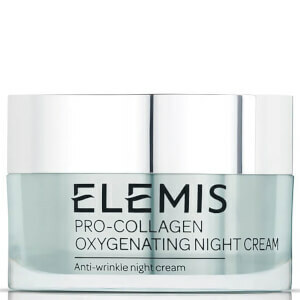 Discover the ultimate anti-ageing treatment with the Elemis Pro-Collagen Marine Cream SPF30; the same best-selling wrinkle cream that has been re-formulated with an innovative blend of sunscreen to offer essential broad spectrum protection. Enriched with a potent blend of Padina Pavonica and Ginkgo Biloba, the rich cream smoothes over skin and reduces the appearance of fine lines and wrinkles to leave the visage youthful. The formula envelops the face in a veil of essential moisture, which ensures skin feels calm and comfortable, whilst visibly improving skin’s elasticity and suppleness. Finished with a next generation micronised sunscreen, the face cream is fast absorbing and offers evenly distributed protection from UVA and UVB rays, without leaving behind unwanted white streaks. Expect suitable protection and skin that is nourished and youthful. Aqua/Water/Eau, Glycerin, Caprylic/Capric Triglyceride, Glyceryl Stearate SE, Isononyl Isononanoate, Dicaprylyl Carbonate, Dimethicone, Butyl Methoxydibenzoylmethane, Ethylhexyl Methoxycinnamate, Phenoxyethanol, Polyacrylate-13, Butylene Glycol, Cetyl Alcohol, Hydroxyacetophenone, Octocrylene, Stearic Acid, Tocopheryl Acetate, Coco-Caprylate, Xanthan Gum, Chlorphenesin, Polyisobutene, Fragrance (Parfum), Disodium EDTA, Lecithin, Tocopherol, Butyrospermum Parkii (Shea) Butter, Citric Acid, Daucus Carota Sativa (Carrot) Root Extract, Triticum Vulgare (Wheat) Germ Oil, Chlorella Vulgaris Extract, Glyceryl Polyacrylate, Benzyl Benzoate, Glyceryl Acrylate/Acrylic Acid Copolymer, Padina Pavonica Thallus Extract, Sodium Dehydroacetate, Polysorbate 20, Sorbitan Isostearate, Ginkgo Biloba Leaf Extract, Porphyridium Cruentum Extract, Dipropylene Glycol, Citronellol, Geraniol, Hydroxycitronellal, Citrus Limon (Lemon) Peel Oil, Limonene, Potassium Sorbate, Sodium Benzoate, Citrus Aurantium Amara (Bitter Orange) Peel Oil.